I am about to reveal a hug gap in my cooking knowledge. Until very recently I had never cooked a soufflle. Life seemed stressful enough without having to do such a tricky last minute dish. I have eaten plenty and even been to a cooking course where the Chef (always a capital C from now on) produced a creamy double baked souffle which effectively eliminates those last minute palpitations. I nearly overlooked the chocolate souffle recipe in the latest Cuisine as it’s under the title “no wheat sweets”. I am over gluten free. 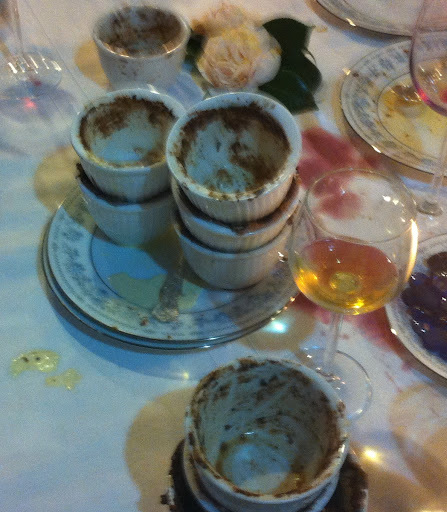 The photo did it though….. individual servings of molten chocolate lava. There’s lots to love about this recipe. Call it ‘dessert’ and serve it for friends or call it ‘pudding’ and make it on a school night when the call goes out for a sweet treat. It’s one of the those desserts that doesn’t require a trip to Moore Wilson’s to get fancy chocolate. Most of us have the ingredients in the pantry. Although it is better with Equagold Premium Dutch Cocoa (which is gluten free). I made it at a friend’s house recently where ‘instant’ and ‘coffee’ are swear words so I improvised by grinding coffee beans. Fab flavour and a bit gritty but there were no left overs. Don’t be tempted to miss out the stage of dusting the inside of greased ramekins with a little sugar. And a big plus, you are left with heaps of yolks for lemon curd, lemon tart, omelette, hollandaise …….. These are delicious served on their own. You don’t need fruit, biscuits or anything else. Honestly! But, lift the lid and slosh in some runny cream for a truly decadent treat. You do have to make these at the last minute which is fine unless you live in an apartment where the dining table is less than a metre from the Kenwood roaring away on Max whipping those egg whites into shape . Chocolate Souffle courtesy of September Cuisine and Rowie Dillon’s book Indulge. Grease ramekins and dust with caster sugar. Tea or coffee cups work well too. Place 1/3 cup cocoa, 1 tbsp instant coffee and 1/3 cup of water in pot, dissolve over heat, and simmer 2 minutes. Set aside to cool. Whisk 6 egg whites until soft peak stage. Add 100g caster sugar and pinch of cream of tartar and continue until stiff peaks form. Gently fold a little into the mocha mixture and then fold in remaining egg whites. Fill ramekins to the top and bake 10-12 minutes or until risen. Serve and eat immediately. I am starving now having trawled through your archives. Just love your passion and determination to tackle anything. I am so jealous you're off to LCB will look forward to hearing all about it. So good to meet up again at the Food bloggers conference this weekend.